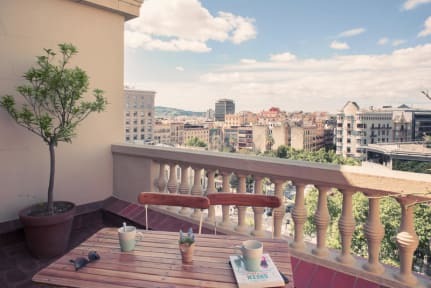 Casa Gracia Hostel is centrally located on a grand, picturesque and distinctly Barcelonan boulevard in the centre of the city, close to Gaudi's La Pedrera, Casa Batlló and high-end shops. 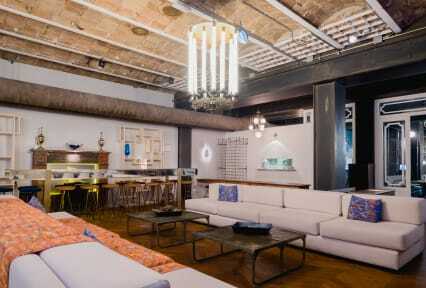 This stylish, clean boutique hostel is 'midway from hotel to hostel, very polished', according to our users, who also tell us they appreciate its community feeling, with nightly pub crawls and dinners. One traveller said this is 'a great location to get some local tapas and experience the authentic Barcelona'. Best hostel I've stayed in! The vibe of this place is so good and the staff were extremely kind and helpful. Its underground bar had a great atmosphere with good music. Definitely recommend to any travellers staying in bcn, especially for location as well! The fanciest hostel I have ever stayed in. Also has a vending machine for coffee, tea, hot choclate (free). Most rooms have a balcony with a gorgeous view. Right in the center of the city. Would definitely stay again! Great place to stay on the cheap! Staff was very friendly and very willing to help. It’s very cozy and amazing location the staff is great ! Casa Gràcia was a beautiful hostel located in a great area of Barcelona. The staff was super friendly and helpful & the amenities were perfect. The terrace on the first floor is a must see for anyone staying here, and makes for a great morning breakfast spot. Wonderful! Hotel-like-hostel! Would have like more fresh ingredients at breakfast, otherwise perfect!! Pros: friendly staff, could store bags, cool building, great location, metro nearby. Cons: WiFi could be a little shoddy, keycard lighting/power has its disadvantages. Close to Parc Güell and La Sagrada Familia. Far from the Gothic Quarter which I found to be my favorite part of the city and far from the beach. Issues: 1) very uncomfortable bed, after 10 min it would sink in the middle. 2) extremely loud, I couldn't sleep even with ear plugs between guests slamming doors shut and people with their atrium windows open up all night. I didn't have one good night of sleep. Really respectful roommates though. A good allround hostel. A bit rough around the edges - we had a broken curtain (which they did try to fix) and bathroom feeling quite tired. But overall pretty good! A nice open space to chill, but was pretty quite during my stay. Didn’t have breakfast (thought it was a bit pricey). Restaurant downstairs seemed popular (couldn’t get a seat when tried to go in) and the bar is very much a speakeasy, which I think could be great fun (I was there midweek and quite early in the evening).